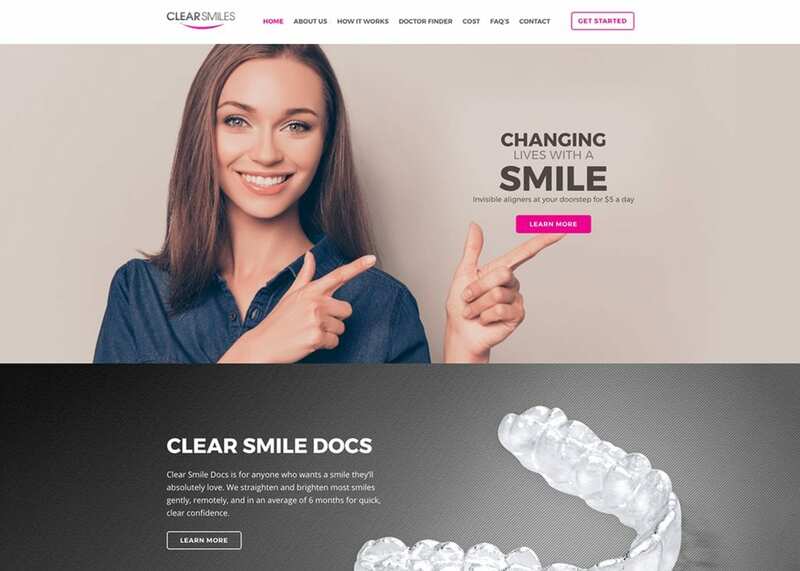 Clear Smiles website was designed to provide a welcoming and professional presentation to their patients, both present, and future. From the opening panel to the final touch, this site promises bright smiles and a touch of beauty to those who choose Clear Smiles as their provider. The overall design of the Clear Smiles website was intended to immediately ease the worries many dental patients face and provide them with hope and optimism for the future of their beautiful smile. The images immediately draw in the viewer, soothing concerns with beautiful smiles and clear information. From the moment you virtually set foot on this page, you’re set to imagining what Clear Smiles can do for you, and how confident and uplifted getting this treatment can make you. This combination of friendliness and professionalism is perfect for turning nervous visitors into happy clients. The use of color throughout the site is both clever and subtle alternating between bright, uplifting warmth and subtle, calming cool tones. The color white has a long history of being tied to a ‘professional and clinical feel’ for websites, being preferred over most other colors in website design. The Clear Smile design also creates a consistent color scheme throughout the site, letting the logo colors flow throughout the site to tie it all together, giving it a polished and put-together look. The design of this page presents the information the patients are going to want most in a clear and unambiguous way, from how the treatment can help them to what effect it could have on their pocketbook. The menu panel across the top makes looking deeper into the website easy, with desired information being just a click away while providing the most pertinent information on the home page. Want to call for more information? Find the nearest office? Get a basic price for the treatment? It’s all included there on the first page. Clear Smiles offers treatments that will make your smile beautiful using the Invisalign system, so this aspect of their business is clearly presented on the first page with most of the pertinent information up front. This appeals to those looking for a provider, erasing questions and reducing the time needed to get the answers to those that remain through the FAQ found at the bottom. Additionally, links are provided to get them directly in contact with the patient through the contact us link labeled with an encouraging “Get Started” while providing an additional link for professionals seeking information. Easy, convenient, and professional is a theme that clearly runs throughout the site. It’s clear from Clear Smile’s design that they wanted their visitors to experience the same ease and convenience on their website that they’d have during an office visit. From the warm smiles present on their faces presented on the website, to the straight-forward information provided, it’s clear that warmth and professionalism are going to be part of the patients time with Clear Smiles.